Because of the murder of his brother Cain was given a banishment from God and from his home region, which was near Eden. 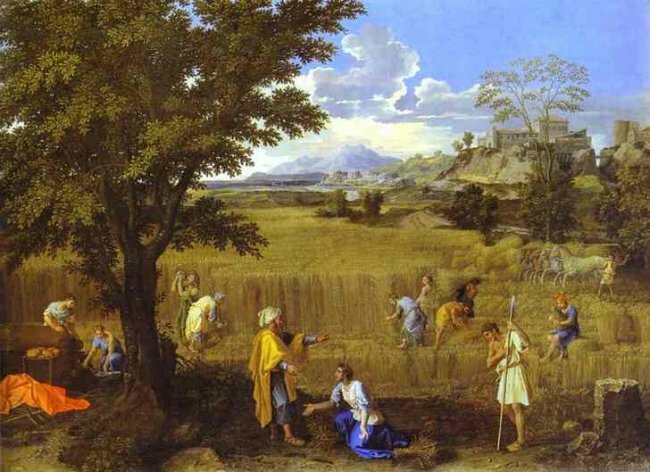 Eden was in Southeast Iraq near ancient Babylon or about forty miles southeast of Baghdad on the Euphrates River northwest of the Persian Gulf. Cain’s leaving God was only a departure of the physical presence of God in time and space, the Shekinah Glory. One cannot get away from God since He is a Spirit omnipresent. The Shekinah Glory is seen in as moving flame at the east end of the Garden of Eden. Cain is seen as only wandering so far and then beginning to have a family and attempt to defy God’s decree for him to be a vagabond. However he settles in a geographic region known then as Nod (Hebrew for the land of wandering). 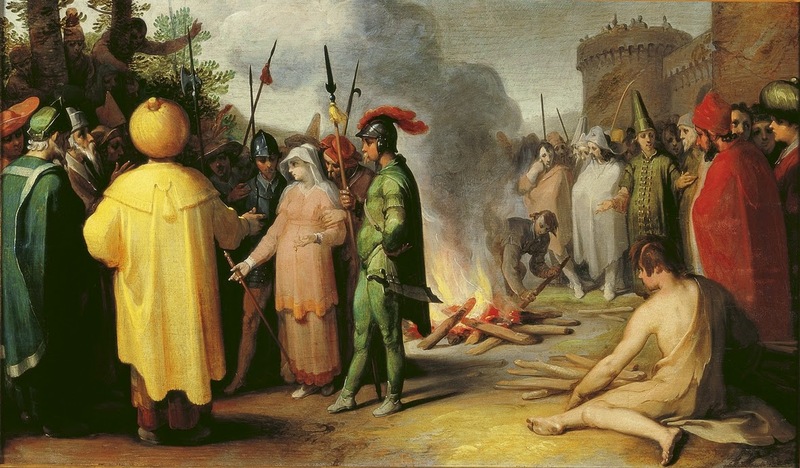 After Cain settled in Nod he had a son Enoch with his wife and this son became the founder of a city by his same name. This was a prohibition of God that Cain violated. Cain was supposed to be a nomad. In violating God’s Word Cain set the stage for a satanically influenced world system where humanity would be organized around the principles of greed, selfishness, ambition, force and pleasure. We are commanded to not love this system in the New Testament (I John 2: 15-17). This city was destroyed with the Flood but the principles returned with the Babylonians after the Flood. Cain and his wife had Enoch. Four generations down from him is Lamech who introduces polygamy and bigamy into the human family. He takes two wives. From the two wives Zillah and Adah there are three sons and a daughter mentioned in the Genesis account. The three sons are the progenitors of two crafts, music, and metallurgy as well as the nomadic lifestyle. The daughter’s contribution must have been significant due to here inclusion but it is not delineated. Those alive at the time and for the next several centuries probably knew of her exploits. Adam then records a song in poetic form by Lamech. This type of Hebrew poetry is parallelism or one line repeating another with slightly different text. Lamech slew a youthful warrior who wounded him and demanded greater leniency in any vengeance that might come his way than that afforded to Cain (Genesis 4:24). 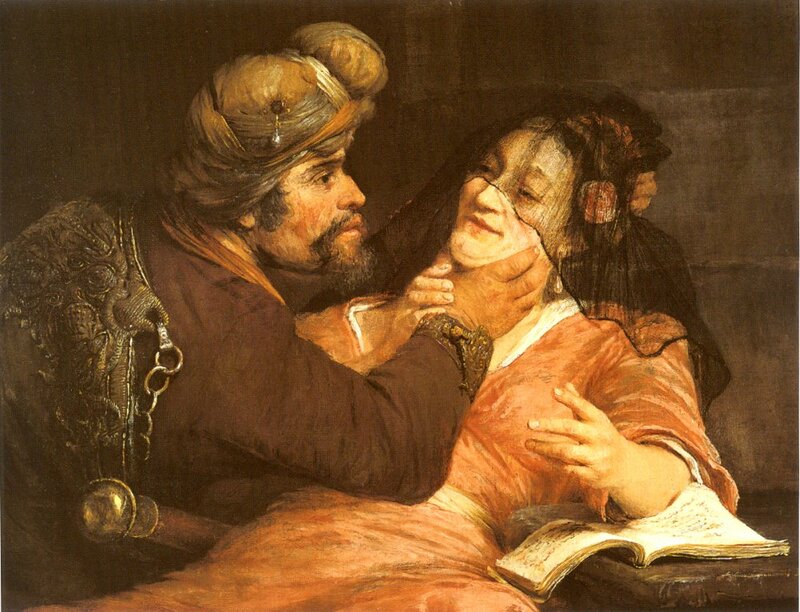 Lamech boasted about the murder. Here is a picture of a selfish society defying God and His laws, seeking pleasure and self-indulgence. Lamech was proud that he killed another person. He bragged about his prowess in the vengeful murder. Lamech then boasts of his self-centered security. Cain interestingly asked God for protection. He must have known the result of the violation of God’s Word. Society would be very violent. Lamech now very far from God believes in himself and his own capabilities. It must be pointed out that there were seven generations highlighted in this passage moving down from Adam. Adam died in the seventh generation. It is important to see the developments in this time period of human history (930 years from Creation). Humanism and sin became entrenched with murder, lying, and self-pity becoming commonplace as well as seeking worldly security instead of God’s offer. All false religions follow the way of Cain. The text now changes to focus on the line of Seth, which will be further developed in chapter five. 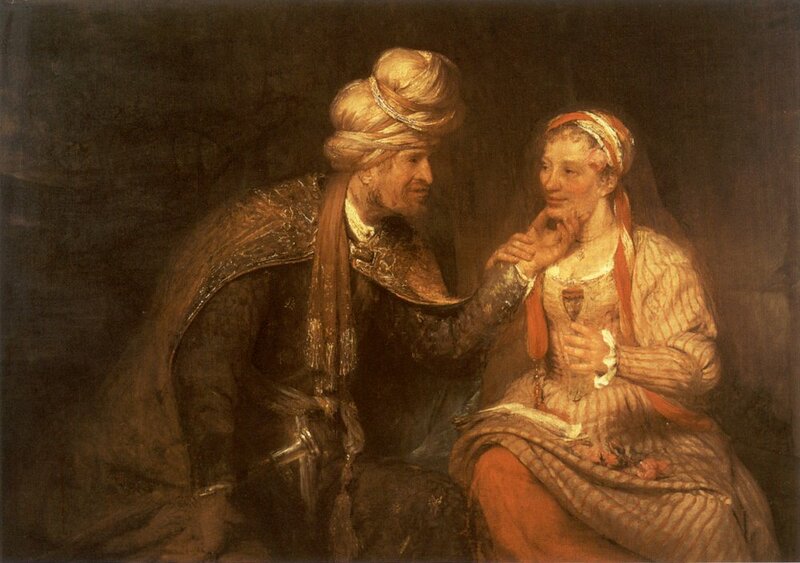 Adam’s wife Chavah (Eve) comments that God has appointed her another son to replace the God centered Abel. His name is Seth and in keeping with the Hebrews having meaning for their names. Seth means, “appointed.” Seth was appointed to take the role of Abel and bring the Messiah. This is the seed line of the woman as promised in Genesis 3: 15. Christ would come through this line as the text in Luke 3: 23-38 clearly chart. Eve provided the naming of Seth exerting her authority over her child. Seth had a son shown here. It was Enosh and his name means “frail man.” Then men began to call upon the name of the Lord. This is a Hebrew expression stating public worship. So this is the beginning of open public worship of God in opposition to the way of Cain, which is worldly and self-centered. In strong contrast with Cain’s godless society was the righteous, those who called on God in acknowledgement. In the line from Seth there was belief. Seth himself was a provision from God, according to Eve’s statement of faith. In the days of Enosh, Seth’s son, men began to call on (“proclaim”) the name of the Lord (Yahweh). Genesis chapter five is the Toldot (generation) of Adam. It expresses the chronology of Adam to Noah. Both of these men represent significant points in the chronology of humanity on the earth. Adam was the first man made by God and Noah the only man (with his family) who survived the worldwide flood. It was the seed line of Adam through Seth that made it through the Flood. The line of Cain did not. Adam wrote portions of Genesis. This is clearly one of them as the text uses the word book to describe this section of Genesis. The Hebrew word for book is סֵ֔פֶר saafair. Because Adam died about 120 years before Noah was born we believe that Noah finished this section of the book of Genesis as well as the events of the Flood and on through the year 2000 from creation. The first aspect of this Toldot that stands out is the length of the patriarch’s lives. We must realize that prior to the decay (Entropy) that came into the earth at the Fall mankind was made to live forever. Decay began and man’s life span began a steady decline to be less than a hundred years. This chronology is repeated in I Chronicles 1:1-14 and Luke 3: 3-38. There are no gaps in these accounts. One person is the father to the next. Further the years are normal years not some exaggerated unreal time frame. The Hebrew text does not accommodate a grandfather-grandson depiction in this account. These long life spans are validated in secular data as well as the biblical account. Two examples are, The Sumerian King List written between 2000 – 3,000 B.C. and Babylonian history by Berossus (Cir. 300 B.C.). The Sumerian King List records in succession the names of most of the kings of Sumer and the lengths of their reigns. The Sumerians were the post Flood Empire that succeeded Nimrod in Babel. 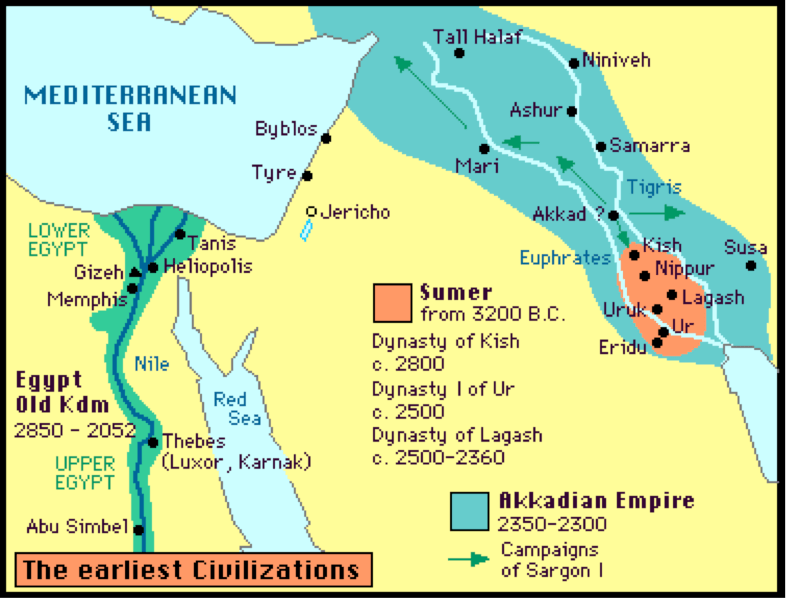 The Akkadians conquered Sumer. Creation was Cir. 4004 B.C. (Hebrew 3760 B.C.) and the Flood was about 2500 B.C. (1656 years from Creation from the Masoretic text). The Sumerian King List purports to identify both pre and post Flood kings of the Mesopotamian (Between Rivers) region. Sumer was succeeded by Assyria and they were conquered by Babylon. The document begins at the beginning of history, the time when ‘kingship (first) descended from heaven,’ and goes up to the reign of Sin-magir (1827– 1817 BC) towards the end of the Isin dynasty. The list is characterized by extremely long life spans of the different kings, especially the earlier ones. One quarter of a million years is assigned to the first eight kings before the Flood and more than 25,000 years for the first two dynasties after the Flood. The length of the lives of the Sumerian kings mentioned is grossly exaggerated from the Genesis account. This is in keeping with other non-biblical accounts of early ancient history such as the Gilgamesh Epic. Some characteristics of these ancient accounts are fanciful but they attest to the validity of the Genesis account of creation, ancient patriarchs, and the Flood. Since Christ validated Genesis and the Old Testament we know that God Himself affirms the structure and data in Genesis. One obvious aspect of the Seed Line is the truncated life of Enoch. In comparison to the others his life was relatively short at 365 years. The Bible says that God took him. God gave immortality to him. The Hebrew word for took is lackach. It means that the Lord captured him. We can translate this as rapture. The New Testament affirms this in Hebrews 11: 5 and says Enoch pleased God. This is a model or type of the Rapture of the Church which is yet future to us and the program of which is explained in I Thessalonians 4: 16-17. The Lord Jesus told us that we would not know the day or the hour (Matthew 24: 36). Many have tried to predict the date of the Rapture even though the Lord Jesus said we would not know. That should be reason enough to not engage in mental and biblical gymnastics to try and set a date. Those that make these predictions harm the credibility of the fact of the Rapture and Bible prophecy. Those who might become believers are deferred from believing the full biblical text and attribute such prophecies to the fools that make these predictions. Although there many views on the general timing of the Rapture of the Church in the long world chronology this author believes it occurs before the Great Tribulation. The earliest indication of a Pretribulational Rapture is found in Luke 21:34-37. Luke 21:34-37 And take heed to yourselves, lest at any time your hearts be overcharged with surfeiting, and drunkenness, and cares of this life, and [so] that day come upon you unawares. For as a snare shall it come on all them that dwell on the face of the whole earth. Watch ye therefore, and pray always, that ye may be accounted worthy to escape all these things that shall come to pass, and to stand before the Son of man. And in the day time he was teaching in the temple; and at night he went out, and abode in the mount that is called [the mount] of Olives. After describing the terrible events of the Tribulation, Jesus states that it will come upon all them that dwell on the face of the earth (v35). In other words, no earth dwellers can escape the calamities of the Tribulation. Yet there is one way of escaping all these things that shall come to pass (v36), but not by remaining on the earth. In order to be able to escape all these things one must be a genuine believer. This means escaping is to stand before the Son of Man, a standing that must happen at a place off the earth, for there is no escape on the earth. That is exactly what happens to believers that are raptured off the earth to stand before the Son of Man. One of the reasons for the Tribulation is to make and end of sin (punishment). Jesus The Christ has already taken the punishment for sin, which is coming on the world, for the believer. If we believe, we don’t suffer any punishment (Romans 8:1) and He takes us to be with Him prior to the Tribulation. Just like Enoch we please God by believing on the Lord Jesus Christ. As already indicated by Luke 21:34-36, the result of the Rapture is to stand before the Son of Man. This was the longest living person who has ever been on the earth. He was 969 years old when he died. The name Methuselah in Hebrew means “His death shall bring.” Methuselah’s father Enoch functioning as a prophet according to Jude 14-15, named him to signify the timing of the flood. The longevity of his life is a testimony to the grace of God who withheld the Flood until he died. Men were given a long time to repent just as we are today (II Peter 3: 8-9). 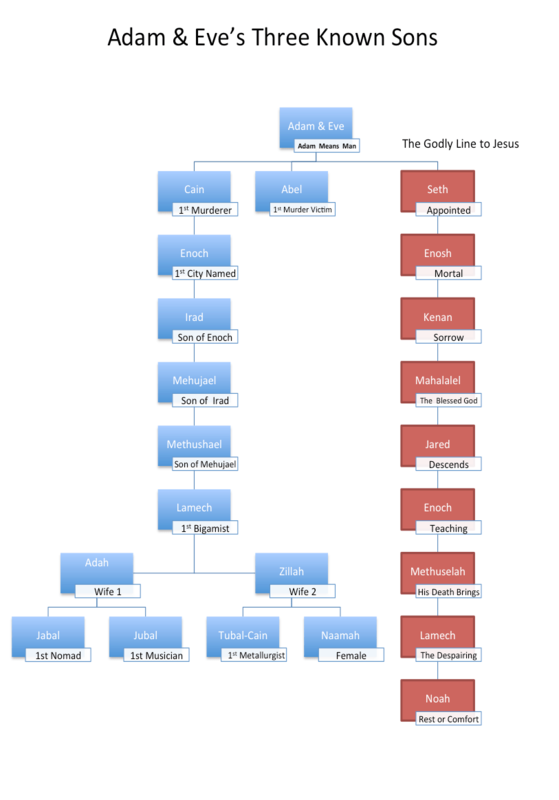 The genealogy of Adam ends with Noah. His name means comfort or rest. This is in direct contrast to the toilsome sluggish work that Adam would experience after the fall. He has three sons who with their wives and children will repopulate the earth after the Flood. None of the individuals cited in the Godly Seed Line died in the Flood. All were either dead or raptured before the Flood and Noah and his sons passed through it. The death account of the individuals personifies Romans five. 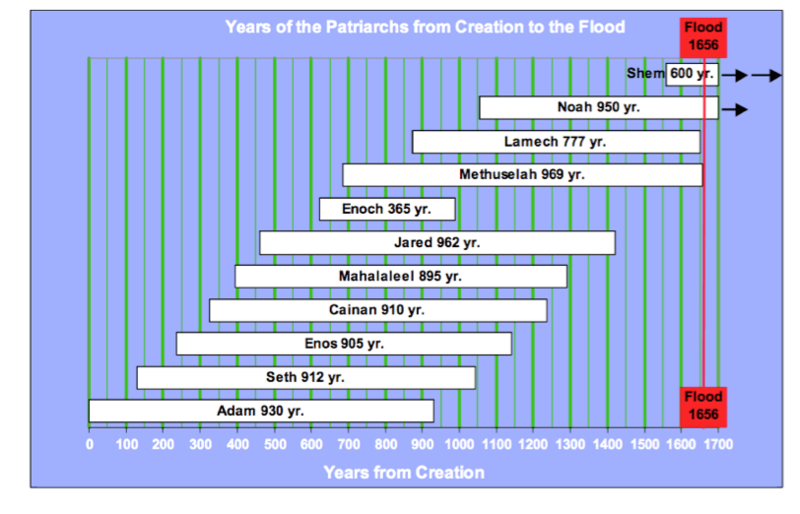 The following chart depicting the early chronology of the Lord Jesus also declares the salvation He offers the world. By reading the Hebrew meaning of the individual’s names it produces the Gospel. Man appointed mortal sorrow. The blessed God descends teaching that His death brings the despairing comfort.